Yes, the new Command & Conquer game EA announced at E3 2018 is a free-to-play online only mobile game. This news is disappointing for fans of the classic RTS franchise who were hoping to get a brand new, fully-fledged PC C&C game. 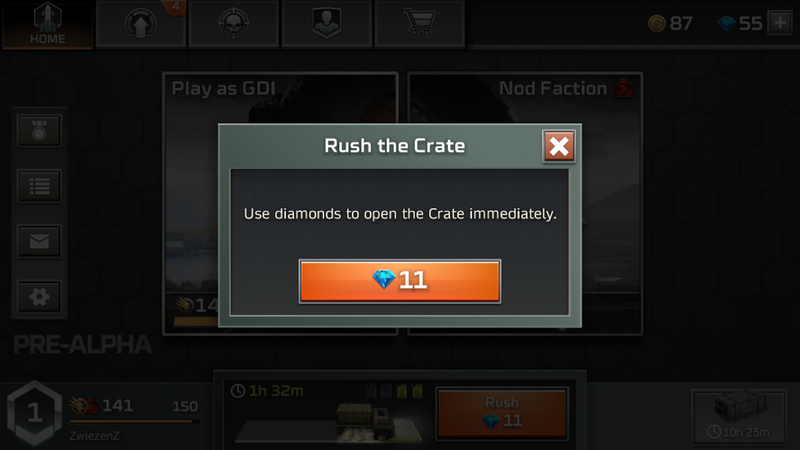 Even if the new mobile game, Command & Conquer Rivals, contains references and characters from the older games, this isn’t a traditional RTS game. 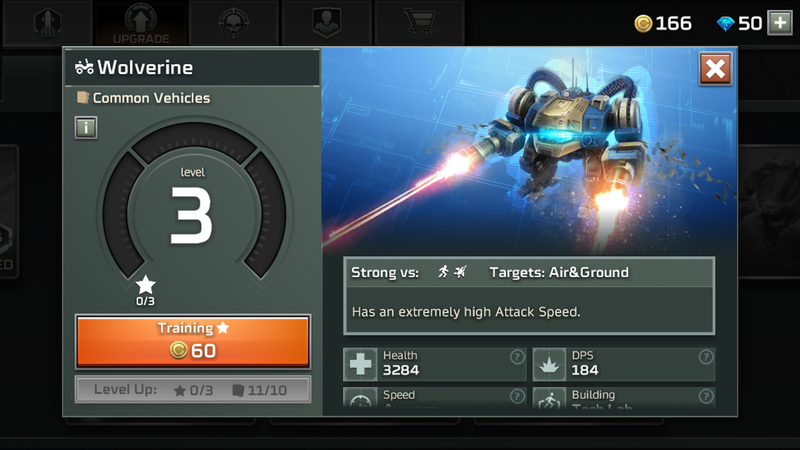 But while Command & Conquer Rivals might not be the true sequel some fans have been wanting, it’s a surprisingly fun and tactical mobile game that feels inspired by Clash Royale and Star Wars: Force Arena. 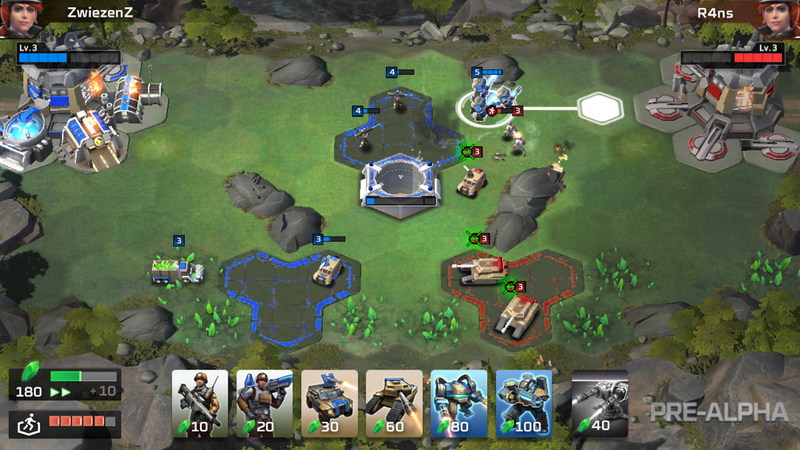 The main gameplay in Command & Conquer Rivals has two players on opposite ends of a field. Each player brings a pre-selected team of units that can be spawned during the match to fight the opposing player’s army. But unlike Clash Royale and Star Wars: Force Arena, these units don’t move on their own. 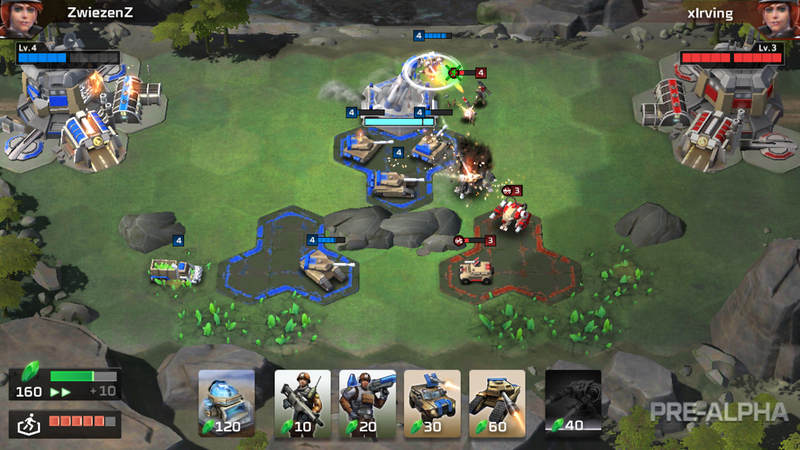 Instead, each player must command their units by tapping on the screen to tell their units where to go. If you tap on an enemy soldier or tank, your unit will attack. The rocks and command points can change position from match to match. 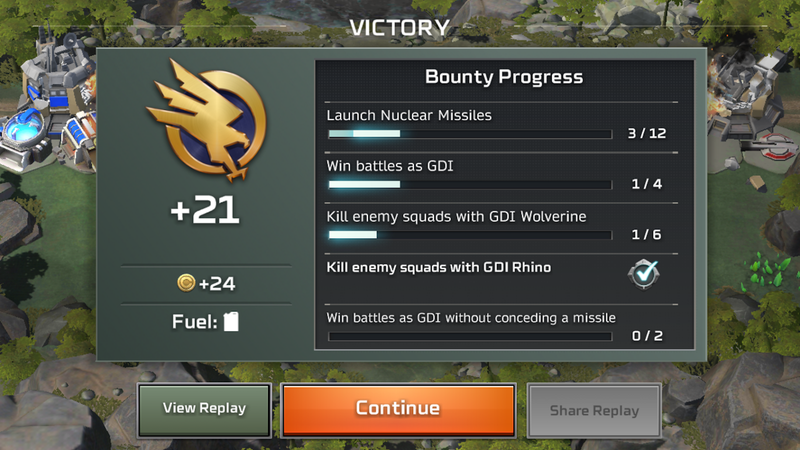 At first the gameplay felt somewhat simple and was visually a little too chaotic but after a few games I discovered there’s a good amount of tactical decision making in every match of Command & Conquer Rivals. Similar to Clash Royale, a key to victory is knowing when to push and when to sit back and let your resources build. But there’s more than just plopping down a few tanks and telling them to attack. Like the classic Command & Conquer games, players harvest and spend Tiberium to create and spawn more units and build new facilities. The harvesters are actually the only unit in the game that will move around the field automatically, searching out veins of Tiberium crystals. Harvesters increase the speed at which you gain more Tiberium and can be destroyed by enemy units, slowing down the production of your army. To spawn more powerful units like tanks and trucks you’ll have to build specific facilities, like a garage or a lab. You can level up units using unit cards and gold you earn from chests and completing objectives. Once you have an army, you have to decide where they should go. This ends up being the bulk of the gameplay in Rivals. The field is divided into hexagons, and you have to find the best spots to set up defences and attacks. Sometimes I keep a few troops just outside a point to help support my other units holding it. You can also flank and hide inside the fog of war, another feature from the classic RTS franchise that Rivals incorporates. Each map is slightly different, but consists of three points. As players control these points by keeping their forces stationed on them, a nuclear missile is armed and aimed. Once the nuclear launch meter fills, whoever is in control of the nuke fires it at an enemy base, taking away half of the structure’s health. Do this twice and you win. The meter goes up no matter who is control and never goes down. Because of this, a player who is losing badly can win by finding the right moment to attack. In one match I had control of all three points, but at the last minute the opposing player ambushed two points with tanks and Wolverines and took the missile platform right as it was ready to launch. They were able to get their second nuke launched and won. I play and enjoy a lot of mobile games, but I was hesitant about Command & Conquer Rivals. The last time EA dug up an old IP and tried to bring it to mobile, we ended up with that awful Dungeon Keeper game filled with annoying microtransactions and long wait times between actions. Thankfully, C&C Rivals is a lot less frustrating. There are no timers or energy mechanics in C&C Rivals. The game never stops to ask for money or crystals to keep playing. Instead of limiting how often you can play, Rivals uses a similar system to Clash Royale and limits how many rewards you can earn. Each win earns you “gas cans” that can be used to claim new chests, but you have to wait a few hours for the chests to be unlocked. You can also only earn so many gas cans, so eventually you max out on gas and have to wait until your current chest unlocks before earning more. Unlike other games that have a similar system, Rivals gives you chests for levelling up and finishing challenges, so you are never completely locked out of getting new rewards. But the game does limit how fast you can earn chests. Some “bounties” you can complete to earn more rewards and coins. Of course you’re able to speed up the unlocking process using crystals, which you will eventually be able to buy. Currently, the Android pre-alpha build of Rivals isn’t letting players buy anything. But some text in the welcome message indicates you will eventually be able to buy items and currency at a future date. Without microtransactions turned on, I can’t say for sure what will and won’t be purchasable. Purchasing chests, for instance—which contain the materials to upgrade your units—could mean that players with a big enough wallet can get more powerful faster. In similar games, good matchmaking can keep the high level players and whales separate from the new players and free-to-play players. We’ll see what happens when Rivals turns microtransactions on. Including Tiberium harvesting and fog of war makes C&C Rivals feel different from similar mobile games and also helps it feel more connected to the classic Command & Conquer games. This probably isn’t the game C&C fans wanted, but I’m still really enjoying my time with Rivals. Matches are fast, there is a good amount of tactical choices to make, and there’s no energy meters or timers limiting how much I can play.